Thoreauly Yours – The Public Pages of Steve Satullo, wannabe transcendentalist living in rural Western Massachusetts, comprising occasional posts and selected essays. The Public Pages of Steve Satullo, wannabe transcendentalist living in rural Western Massachusetts, comprising occasional posts and selected essays. I am well past the temptation to inflict my journal entries on the public (which public was that, exactly? ), but this little nature vignette seems justified in light of the name of this blog. Thoreau puts me to shame as a woodsman and naturalist, but I share his devotion to our New England woods. 7-9-18: When I went out for a walk from home in the evening, the sun was warmer and starker than I expected, so rather than hike uphill, which I didn’t feel up to anyway, I decided to motor into Mt. Greylock Reservation, to our private little parking spot where the Northup trail crosses the road, a seven-minute drive (2.9 miles) that is as pleasant as the walk. The hour was good to see beavers, my last two evening walks to the pond featuring close encounters, but I didn’t think I had the energy to make it that far. Level and shady was the hike I was looking for, but as happens with encouraging regularity, once I got going, I kept going. A bit buggier than the previous cool morning, with a different cast of light, Northrup remains my current signature walk. I approached the planking over the main beaver dam stealthily, hoping to come upon the animal where I’d walked right past last time, until it swam by placidly with a large green-leaved tree limb in its mouth. No, not this time – no mammals in the area, just water-skimming insects. As I went to step onto the split log, a cannonball landed in the middle of the pond, sending out waves of sound and water. No, not really of course, but the shock was similar. From out of the concentric ripples, I saw the head of a beaver floating in my direction. Had it seen me? Oh yes, it had seen me. But it wasn’t scared away. Instead it arrowed across the water in my direction. About twenty yards away, it stopped and eyed me, then executed another flip to slap its broad, flat tail on the water. It was strange to come face to face with such aggression (or defensiveness) in a wild animal. I wasn’t afraid exactly, but it was definitely unsettling. I was reminded of my stand-off on the Bradley Farm trail not long ago, with an antlered young buck who was not about to bound off into the woods, like most deer. As I scurried away, presuming it was time for a pack of young kits to take their evening swim, I was further rattled by rustlings in the woods on either side of the trail, with snorts of the sort that a bear might make. (Perhaps the beavers thought I was a hairless bear.) Or maybe it was a moose making the noise, since it was near where I once crossed paths with a pair of them. Anyway, it was clear that I had stepped into the middle of a woodland drama that I could little ken. But I got the message that there were things in the deep woods that didn’t take kindly to my presence, and high-tailed it out of there, white flag flying. In which septuagenarian Steve Satullo reflects on a visit to England around May Day 2018. Of isolation and stasis, I am a devotee. I like to be all by myself, in one place, without interruption or excess exertion. So travel is always a stretch and a stress to me, and more so as I pass into my seventies (here’s hoping they betoken serenity, and not severity or senility). I figure that if I’ve got to put myself through it, I ought to get some writing out of it. And unaccountably, I suspect readers may be more interested in places and people far removed from my usual narrow track, when I am compelled to get outside my own head and look anew. So the Old Man goes overseas, to see what he can see, over there in England, where his mother came from, and his son now lives and works. He’d be at sea without the ballast of his matey, or without the piloting of his daughter-in-more-than-law. He’s an “accidental tourist,” a rustic old-timer with little taste for new-fangled gadgets and citified gizmos, let alone foreign ways. But he’s also a flaneur, just strolling about and observing, without plan or purpose, but with an eye out for signs leading to wonders. I haven’t been posting much new material here, I’m afraid, but I’ll say a few words about the writing I have been doing. And offer a promise of more in the near future. For most of the past year, my top priority has been the third book on which I’ve collaborated with Irish storyteller Kevin O’Hara. The first was Last of the Donkey Pilgrims, about his journey round the entire coast of Ireland, on foot with a donkey and cart. Now in its 17th printing, the book has become quite beloved, and found itself in remarkable company on this list of the best books about Ireland. The second book was A Lucky Irish Lad, Kevin’s memoir of growing up as an immigrant in Pittsfield during the 1950s and 60s. The new book, probably to be titled Bearded Nurse in Bedlam: Off-the-Wall Tales from the Locked Ward, emerges from his long career as a psychiatric nurse at Berkshire Medical Center. Kevin has compiled a wide range of stories about patients and himself, and we are in the home stretch of the rewriting process. Cumulatively, it is a broad and humorous panorama of genuine human experience, and as such may find an even wider audience than his Irish-themed stories. But first it needs to find a publisher who can do it justice. On Cinema Salon, I’ve completed my survey of the best films of the previous year, and am re-committing to film comment, even if I’m no longer a film programmer. I mentioned my son Nat’s appointment to Oxford heretofore, and can now report that he and Nicole are now over there to start the school year. Given the name of this blog, I ought to mention that I am deep into the wonderful new biography of Thoreau by Laura Dassow Wells, published on the 200th anniversary of his birth this summer. Hallelujah – my son Nathaniel Erb-Satullo has got a job! A recently-minted Ph.D in archaeology at Harvard, he has just come through an utterly uncharacteristic twenty months in the desert of rejection, and some eighty fruitless job applications, experiencing the downside of academia’s over-production of doctoral fellows, as its way to keep up a steady supply of cheap teachers. All the other synonyms, however, apply: fortunate, favorable, felicitous, opportune, advantageous, auspicious, welcome, timely, serendipitous. It was a terrible wait, but just the right job came along, with Nat returning to Oxford to teach a course he took as a M.Sc. student there ten years ago. And at the right time ultimately, as another, much less suitable college, where he was in line for a tenure-track job, delayed their decision so long that he never had to make the tough decision to settle for a far from ideal situation. I gave some thought to advising Nat to look outside of academia, for someplace that would welcome all his estimable skills, but after his luck had turned – with his digging permit for this summer’s archaeological field season in the Republic of Georgia arriving at the same time as the Oxford offer – there arrived the section leader evaluations from his Harvard students this past semester. How wrong I was to think there was anything Nat should be other than a professor! The words most often used were “enthusiastic” and “fantastic” and “best teaching fellow I ever had,” but the comment I liked best referred to him as “insanely knowledgeable.” Thankfully, he now has a sane opportunity to pass that knowledge along. No, I am not referring to Trumpism. That disease has a name, and “doctors” are working on a cure. I am talking about a disease that does not even have a name, a test, or a known cause, let alone a cure. Some prefer “Myalgic Encephalomyelitis,” which is both obvious and obscurantist, neither describing nor defining what the disease really is. Whatever it is, my daughter Rachel has had it for more than ten years. And whatever it is, it’s not all in her head, but the post-viral result of a damaged immune system. The symptomatology is clear enough, and the large number of sufferers worldwide, perhaps millions, has begun to emerge. One effective spokesperson is Jennifer Brea, whose film Unrest has just premiered at Sundance, to good reviews. 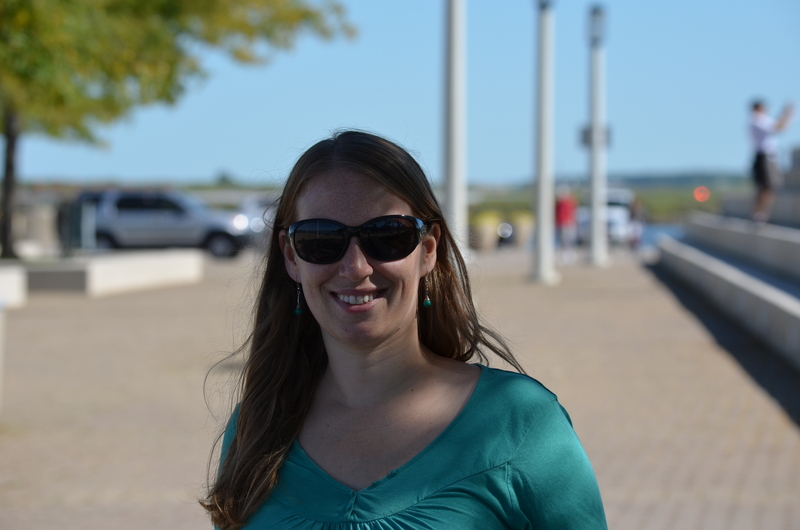 You can get a good feel for the film by watching Jenn’s galvanizing TED talk. Rachel’s loyal longtime boyfriend Alex Lipschultz also had a film premiere at Sundance, Menashe, on which he served as producer and screenwriter. IndieWire named it among the best films of the 2017 festival. It has been picked up by A24, the distributor of Moonlight and other distinguished films. Welcome to my newest blog, where I will make occasional posts laden with pictures and links – regarding travel or other public themes – and archive selected personal essays – more literary and permanent. 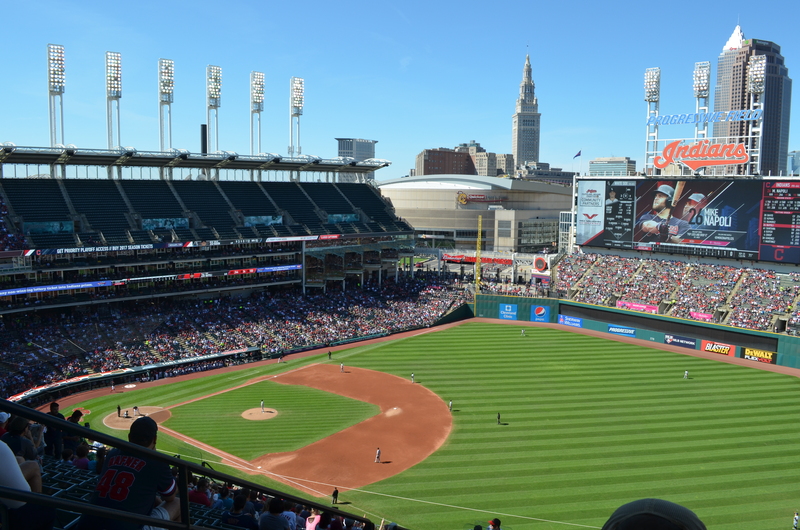 My “Cuyahoga Dreamin'” post was delayed till I could put together all the elements of this website, so it’s rather retrospective as this point, as it’s barely a month till Spring Training resumes and the Cleveland Indians make another run at the World Series (with heavy hitter Edwin Encarnacion on board!). For those who care about such things, the Chief Wahoo shirt and hat you see pictured below are now on their way to the Museum of Jim Crow, along with other racist memorabilia. For Christmas, my son Nat gave me a Tribe t-shirt with the inoffensive Block C logo, so now I can celebrate my hometown team without denigrating Native Americans. For Berkshire Dreamin’, see the header above, with a summertime view of the house from which this blog emerges, and three of the twenty houyhnhnms that are my closest neighbors. I’m afraid today’s midwinter view would not be nearly as appealing. But I invite you to return to this blog in any season. On a recent trip to Cleveland, I found myself in different parts of town, and found the town in different parts of myself. Much of the trip echoed a visit I made in 2004 and wrote up as “A Day’s Walk in Cleveland: From Downtown to the Heights,” which can be found as a “Selected Essay” to the right, with an addendum from another visit ten years later. Here I focus mostly on new places and new impressions, as I paradoxically felt more like a homeboy of Cleveland than at any time in the past fifty years, even though I approached the “Forest City” more as a tourist, taking in 9 of the top 20 Cleveland attractions on TripAdvisor, and eating at 3 of the top 16 restaurants, with several others within walking distance of the house on West 5th where we were staying. And like a tourist, I had my picture taken in various locales – and despite my aversion to my own image, I include many in this narrative. 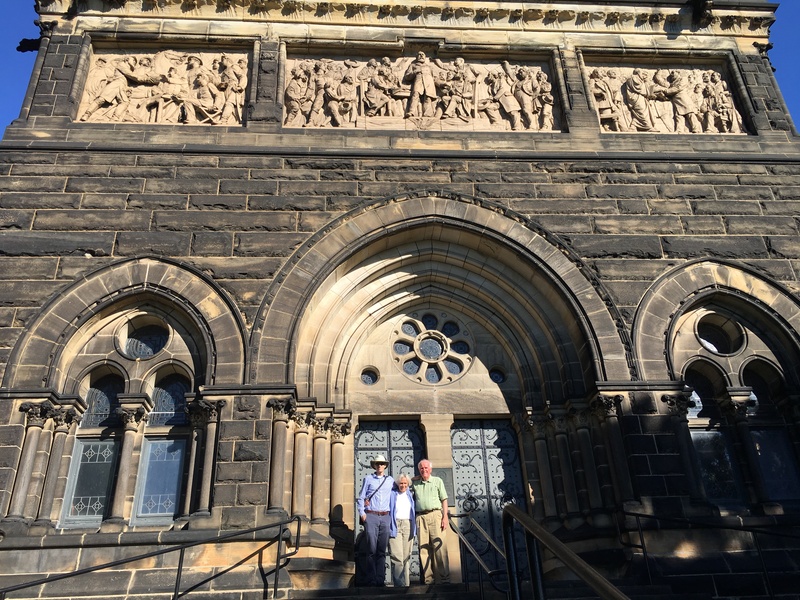 With CE, I incorporated three days and two nights in Cleveland into a longer trip that took in several notable and highly-recommended sites in upstate NY, preeminently Oneida Community Mansion House and Corning Museum of Glass. I’ll write about them later in passing, but this story is primarily for fans of Cleveland and its teams. 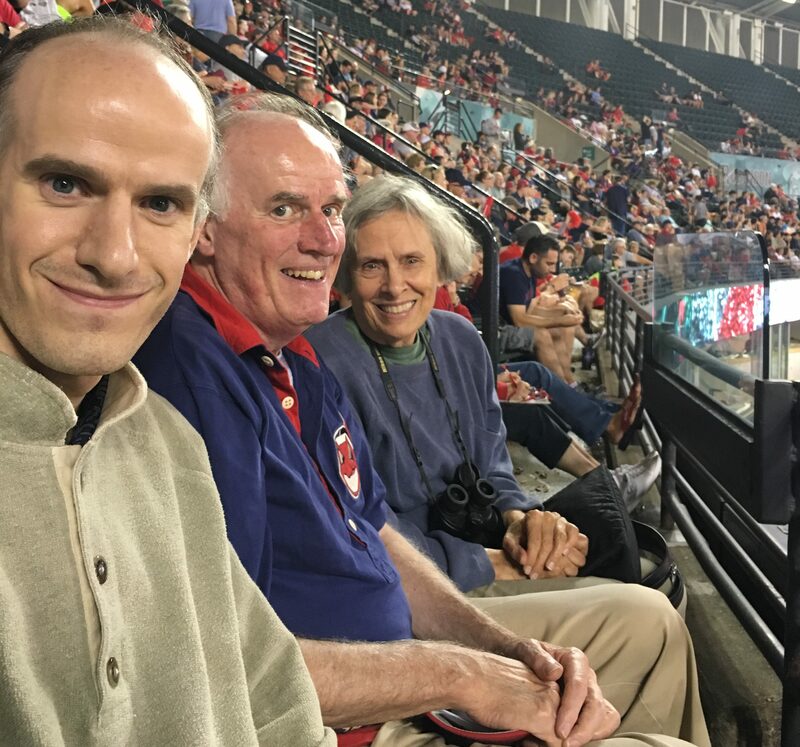 At 10 years old in 1995, just the age when sports affiliations truly bond, my son Nat pledged allegiance to his father’s hometown Cleveland Indians, then the “best baseball team in the universe.” In early July this year, while the Tribe was in the midst of a franchise-record 14-game winning streak, he read a FiveThirtyEight article titled “The Cleveland Indians Are Dominating Like It’s the ’90s Again,” which revived his interest enough to agree to a Progressive Field pilgrimage that I’d been proposing for years. 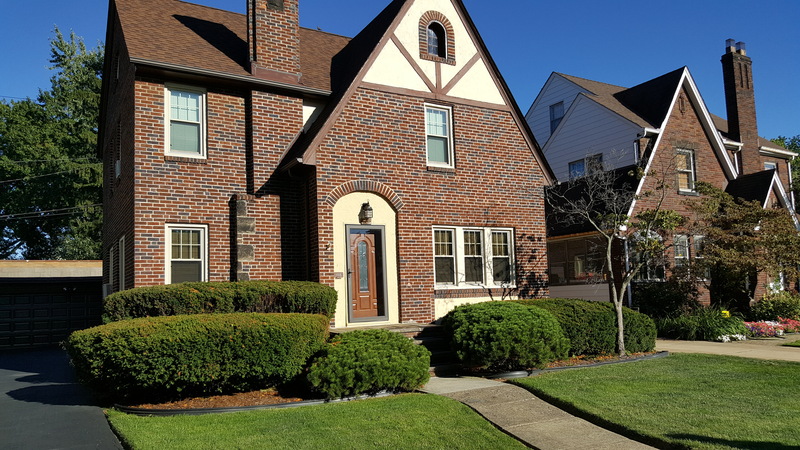 CE and I picked up N&N at Cleveland Hopkins Airport on Friday morning, and within twenty minutes we were at the rental house, where we were able to check in early, so Nicole could set up several conference calls with a major corporate client. Meanwhile, Nat set out with his parents for an excellent breakfast at Grumpy’s, near Lincoln Park, the focal point of the Tremont neighborhood. Nat brought Grumpy pancakes back for Nicole, then joined her with laptops open on the dining room table, while CE went up to read and rest, and I went off on several walks. The first took me down the modest old residential street of West 5th till I angled right on Literary Road, and downhill into an entirely different landscape, one that sang of Cleveland to me and set off vibrations of Cleveland-ness in my soul. Down on West 3rd, I walked toward the Cuyahoga, amongst those monumental cones of crushed stone more evocative to me than Gatsby’s ash heaps. The river was winding – but not burning – through the landscape, crossed by vehicular bridges and railroad trestles with lift bridges, an elevated freight train moving slowly through the air, while cars whizzed by on the Interstate arching over all, with the downtown skyline as backdrop. Going back uphill, I walked around the neighborhood, guided by frequent “Historic Tremont” signs. That history is many-layered and fascinating — starting with short-lived Cleveland University from the 1850s, which began as an offshoot of Oberlin much as Amherst was of Williams, but promptly died with its founder. The one imposing building that remains to this day has been converted to loft apartments. Street names are another remnant: Professor, Literary, University roads. In the early 20th century, the neighborhood flourished as a largely Eastern European immigrant community, from which the men could walk to work down in the industrial Flats. 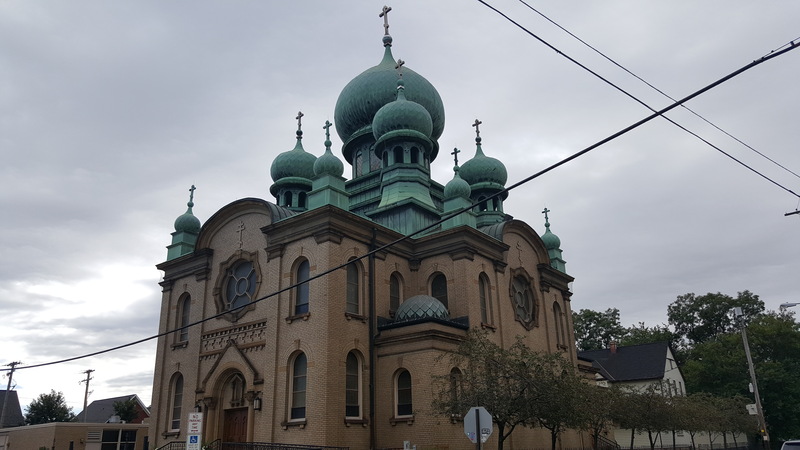 This accounts for all the varieties of Eastern Orthodox churches in the area — Russian, Greek, Ukrainian, Polish – of which the most famous was the location for the wedding scene in The Deer Hunter. That was also the era for most of the housing stock, including the house where we were staying. In addition to Rust Belt decline, the neighborhood was afflicted in the 60s and 70s by a crisscrossing of Interstate highways (which now makes for easy access in any direction), cut off and trapped in amber. Until, that is, the usual sequence of urban homesteaders moved in: those seeking cheap rents close to downtown, then artists, then bohos of every stripe, then restaurants and galleries, and finally new upscale townhouses on the north ridge, with great views of downtown. There was also a mixed-income development on the south end of the ridge, near our rental house, with views out primarily on rusting blast furnaces. In the middle of the ridge, on our nearest cross street, Jefferson dropped away to a view of the huge clustered silos of a cement plant. This trash-strewn waste area made for an out-of-the-way place to toke up, but as I did so, I was overwhelmed by a magnificent embankment of blooming morning glories, a fitting symbol of regeneration and reclamation. 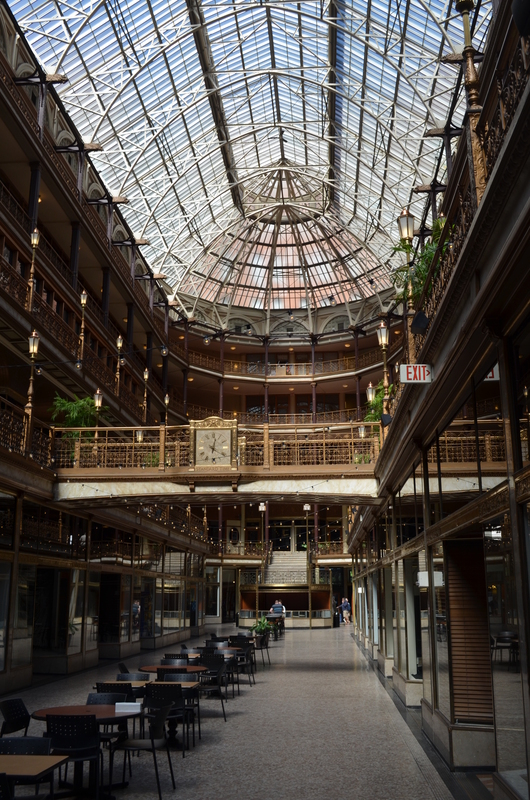 I went back to the house and retrieved CE, then drove over to West 25th, where the century-old West Side Market anchors the equally-revitalized Ohio City district. I don’t remember ever venturing into the near west side during my younger days, except to visit the zoo, so this was a completely new Cleveland attraction to me (#3 on the TripAdvisor list). Going in, CE asked me what the Cleveland food specialty might be, and I replied, “Ground meat stuffed into intestines,” and boy, was that right! — every way you could think of — but also thick slabs of unnaturally red meat, along with varieties of fish and fowl, baked goods of every sort, as well as condiments and accompaniments (a whole counter devoted to hundreds of types of hot sauce). Then another building’s worth of fruit and vegetable stands. I wasn’t really tempted by anything, but it was definitely a trip, and worth a trip. All done up nicely for the Market’s 100th anniversary. By the time we returned to the house, Nat was willing to shut his laptop and go out for a walk with me around the neighborhood. Trevor Bauer as usual mixed occasional lapses into his general effectiveness, but the Indians pounded away in the middle innings for a fully-satisfying 10-4 win over the White Sox. Definitely a fun night at the ballpark! Reconvened and cleaned up at the house, we walked a few blocks, past the aforementioned St. Theodosius, to Lucky’s Café, for a farm-to-table breakfast at a picnic table outdoors, on a wonderfully lucky Saturday morning, with the perfect weather that lasted the whole trip. Then the group finally got on the road for the Steve Satullo Heritage Tour. First stop was the 93rd & Kinsman neighborhood where I lived through 2nd grade. I already knew from Google Maps Street View that 9411 Carton Avenue was now a vacant lot, but it still surprised me that a brick house newer than the wood houses in Tremont should have been demolished, though there were many other gaps on the street as well. Driving slowly, but not so slowly as to be intrusive, and forbidding Nat to take pictures with people in them, we drove down Carton, past my school — Boulevard Elementary, now signed as the Freedom Covenant Center, though surrounded by a chain-link fence and possibly abandoned. The field at the end of the street, where I played my first pick-up baseball games (I remember as a 7-year-old playing third base one time, and taking a hard hop to the mouth), was now a more recent semi-suburban housing development. I circled back to East 93rd and drove the eight blocks to St. Catherine’s Church, where I received my indoctrination in Catholicism, scared out of my wits in catechism class (a ceramic bust of Jesus – with a flaming, bleeding heart popping out of his chest – haunts me to this day), and retaining crazy ideas (I wouldn’t eat an apple till 6th grade because it was such a sin, the original one in fact), which accompanied me in our move to the Heights, though church and Sunday School attendance did not. I remembered the church as a very imposing brick pile, but it too was now a vacant lot, though its absence was confirmed by the still-standing convent adjacent. In the ten blocks back up 93rd to Kinsman, we passed Zion Methodist Church, Lake Galilee Baptist, True Gospel Missionary Baptist, Love Center Interdenominational, Golgothan Baptist. If we’d gone two blocks in the other direction, we’d have encountered, per Google Maps: United Missionary Baptist, Tree of Life Temple, and the Glorious Church of God-Christ. From there we went on to University Circle, where in looking for a parking place we passed by the Peter B. Lewis Building, designed by Frank Gehry like a vest-pocket Guggenheim Bilbao. It wasn’t very large, but on a sunny day, the titanium swirls lit up the landscape from many perspectives around the Circle. We walked around and through the Cleveland Art Museum, with admission amazingly still free, splitting up for an hour to follow our separate interests. I wanted to take a lightning tour of the whole place, including the two expansions since my days of going there on school excursions, and check out which paintings released megatons of nostalgia or trapdoors to the past. It’s really a wonderful museum in its own right, but as the museum of my youth, it had a particular pull for me. Congregated again, we drove up through Little Italy to Coventry, where the three others stopped at Tommy’s for lunch, though I was still going strong on my Lucky’s omelette. 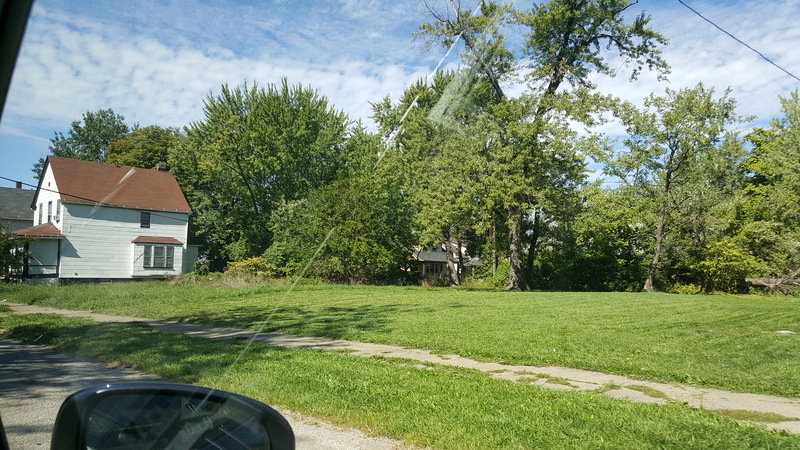 After that, we swung through Lake View Cemetery and stopped at the James Garfield Memorial, though in the dozen years since I was last there the view of the lake and downtown had closed in, so we made short work of it. Then up Mayfield and past the former Severance Center and other memorious sites, we turned right on Crest and past the still-vacant — but new in my youth — Severance Millikin School (apparently the deal to turn it into a yeshiva fell through). Thence along my walk home and around my various paper routes to 1467 Middleton Road, where we got out and walked up to old Oakwood Country Club, now fenced off and apparently eaten into by a WalMart on the south. 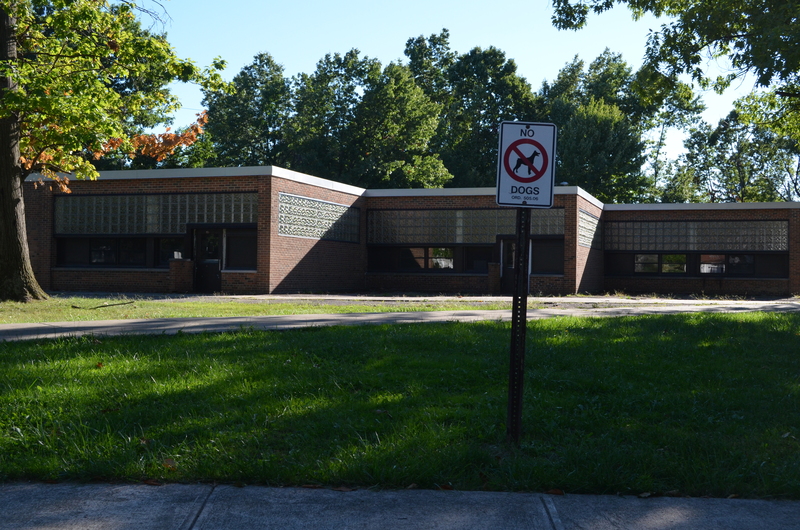 With some folks requesting a restroom, my first thought was to try the Noble Road Public Library, where I got my start in the book business, as a library page, almost 55 years ago. We luckily got there just before closing, and I was happy to see the inside of the place, both as it was in my revived memory, and as it had become after a recent renovation. From there, we followed the two-mile route I walked to Heights High. In the “B” streets where most of my school friends lived, the Orthodox were out in droves, in the hour before sunset on the Sabbath. It was amazing to see all the construction going on at the high school, with the post-Sputnik science wing torn down and much other work afoot. Afterwards I found out that the school had been temporarily moved to Wiley Junior High, while our old 1930s building was being restored and transformed into four schools as a pilot program for the Gates Foundation Small Schools movement. From my day, enrollment had fallen by half to 1600, and transitioned to 90% Black, but it was nice to see some resources being expended on the old Black & Gold. To drive home the difference between Cleveland and the Heights, I took the newbies down Fairmount Boulevard to see the mansions of Shaker Heights, and then down Carnegie through the metastasizing medical city of Cleveland Clinic. So Nat’s choice of the Bourbon Street Barrel House turned out to be inspired, as we got seats in a cozy little corner, with our own private tv to watch the game. The beers were interesting, the food was good (though I ate way too much in finishing CE’s as well as my own), and the company was most enjoyable, so it didn’t really matter that the Tribe lost big to the Pale Hose. 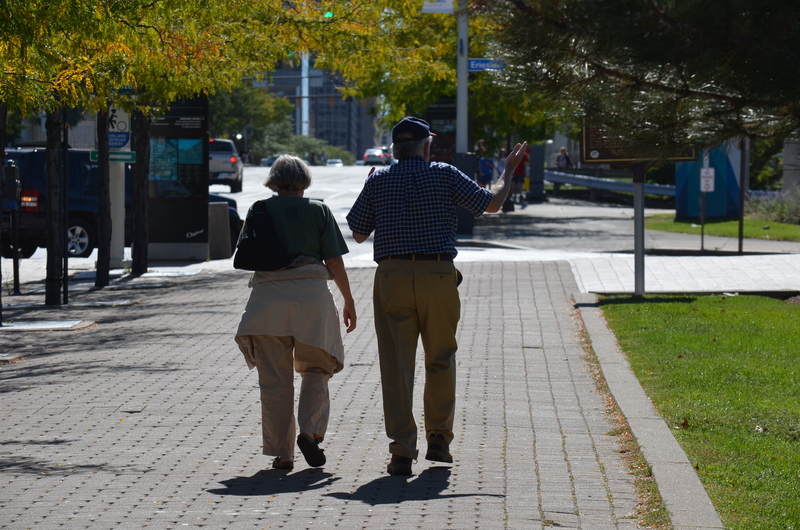 Sunday morning, we repeated our walking and running routines, but checked out of the house reasonably early, to go search for parking downtown and a place to eat breakfast. This time it was Nicole and her smartphone who guided us to Urban Farmer (#8 on TA), which turned out to be very good indeed. 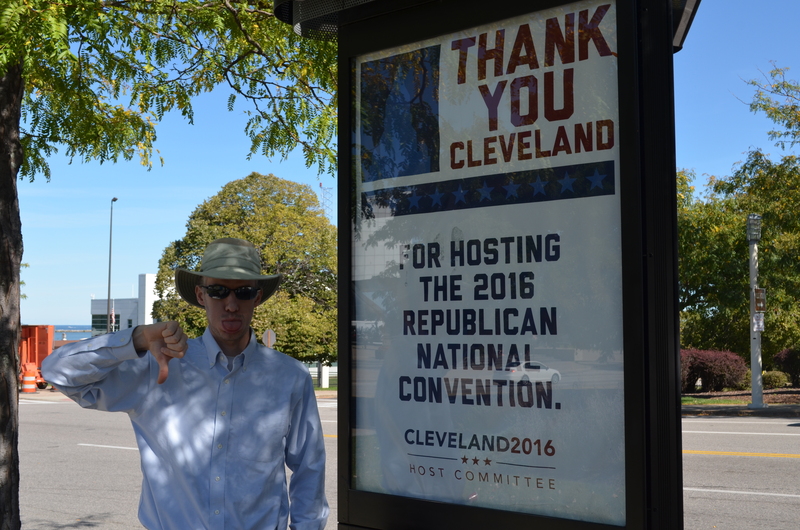 After that I led the newbies on a walking tour of all the highpoints of downtown Cleveland, perhaps wearing them out. Down East 9th to the lakefront beyond the Rock’n’Roll Hall of Fame. Here are pictures of Nicole and Nat enjoying the scene. We came back up past City Hall, through The Mall and The Arcade and around Public Square, down Euclid past the familiar terracotta front of the May Company, where I remembered a picture of me as an alarmed toddler on the lap of the department store Santa. Back on 9th headed to the ballpark, we made a pit stop in a fancy old bank that has somehow become a Heinen’s supermarket. 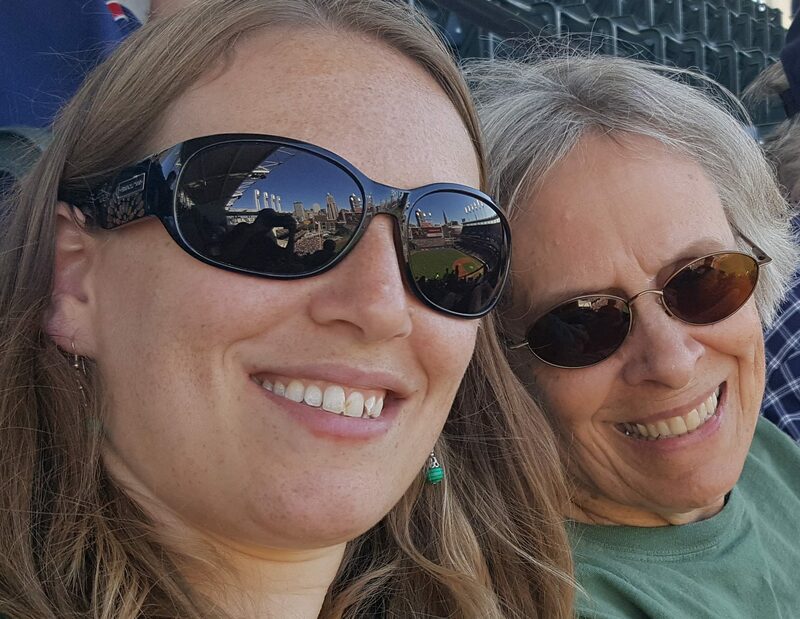 Then crossing over to the ballpark, we were accosted by a weaselly Trump fanatic passing out leaflets at the street corner, and I could not avoid a brief verbal altercation. The Indians had a chance to clinch the division when the Tigers lost, but they went down meekly 3-0 to the Sox (on a day when everyone in baseball was shaken by the death of Jose Fernandez in a boating accident.) We left in the 9th inning to get back to the car, and hightail it past the ballpark before the game ended. In short order, we were depositing N&N at the airport departure gate, and continuing on ourselves to Erie PA.
Again, hats off to Nicole for making such a great time together happen. And thanks to Cleveland for providing such a pleasurable venue. 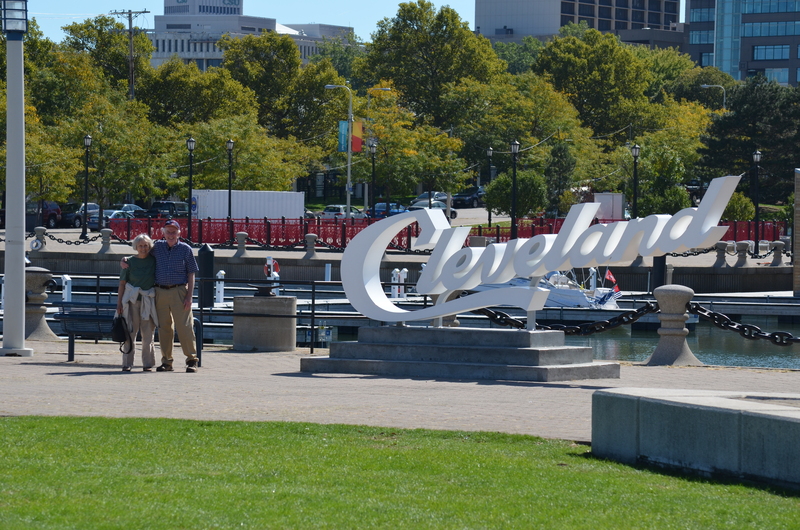 Some may have come expecting to scoff at “The Mistake by the Lake,” but everyone departed with a vision of Cleveland as a very livable and tolerably with-it urban playground. I’d picked out the Baymont Inn in Erie as conveniently located to stay both coming and going – new, inexpensive, and right on I-90. On Thursday, we’d gotten in very late, after a morning at Oneida and afternoon in Seneca Falls, then a big back-up behind an accident on the NY State Thruway, and left early Friday morning to meet N&N’s flight to Cleveland from Boston. But on Sunday, we got there early enough to enjoy the accommodations, and generally recover from a very packed few days. We got back on the Interstate to go one exit east for an Applebee’s, the best of a lacklustre line-up of local dining options, in the midst of a staggering array of third-rate chain restaurants. On the way, we could see another big back-up in the westbound lanes. So we rushed through dinner, while figuring out the map function on CE’s iPhone (handed down from Nicole), in order to find a way back to the inn in daylight, without getting back on I-90. That quest achieved, we pulled into the Presque Isle Downs & Casino, which was directly across the street from the Baymont. I’d never set foot in a casino since the long-ago days of one-armed bandits, and only in Nevada, so this was certainly a trip in itself. The lights, the noise, the people. All intolerable, except for the feeling of smug superiority the whole scene engendered. At least I’m not like these people. This is one vice I am not tempted by at all. There’s plenty I could be accused of, so if you want to call me a stoner, slacker, pretentious, bigamist egomaniac, well then, go right ahead. But gambling has absolutely no appeal for me. So here is the decline of civilization, the epitome of unproductive human activity. We made one deliciously horrifying circuit, then escaped. The attached race track was languidly running a horse race, so we went over to watch, which reminded me of olden days at Pownal Racetrack. The Baymont was also conveniently located for an alternate route home, through the Southern Tier of NY State, allowing an easy stop in Corning, which we had foregone in the time squeeze of Thursday. Corning Museum of Glass was the antithesis of the casino, an endlessly enthralling cultural attraction. They had just opened a new addition last year, and seemed to have done everything right. As wonderful as the new Clark is in many ways, the new Corning seems to have answered all museological needs optimally, from shop and food service, to demonstration areas and totally logical progression through the galleries, without herding. We were cheerfully given two free admissions when I showed my Clark ID, and told that the tickets were good for two days. I wondered why at first, but after several delightful hours was definitely ready to come back for more. While raving about places to visit, I have to go back to the trip’s beginning the previous Wednesday. Having taken the US 20 Scenic Byway, we got to Cooperstown by noon. With an hour before her appointment at the New York State Historical Association next door, CE joined me for a visit to the galleries of the Fenimore Art Museum (grudgingly offered one free admission, despite the fraternal relationship to the Clark), small but of varied interest, especially folk and Native American art. When CE went to her meeting about donating some family documents from the very early 1800s, I finished my tour of exhibits, shop, and grounds (along the shores of Otsego Lake), had lunch in the café, and then went across the street to the Farmers’ Museum, another benefaction of Stephen Clark, with an 1840s village re-created from buildings brought from all over upstate NY. Cooperstown was very pleasant to visit, even without the Baseball Hall of Fame, which is worth a trip but not this one. We drove on and reached the Oneida Community Mansion House by 5, and checked into a wonderfully large and high-ceiling room in the building that housed 300 “Bible communists” in the decade after the Civil War. This was my first visit to Oneida, though I have been obsessed with the Community and its patriarch John Humphrey Noyes for decades. In fact, my historical novel-in-progress American Candide germinated from an idea planted twenty years ago for a story about Oneida. The canvas is much broader now, but the scene remains that was the seed of it all, a bit of dialogue that is key to the themes of the book. 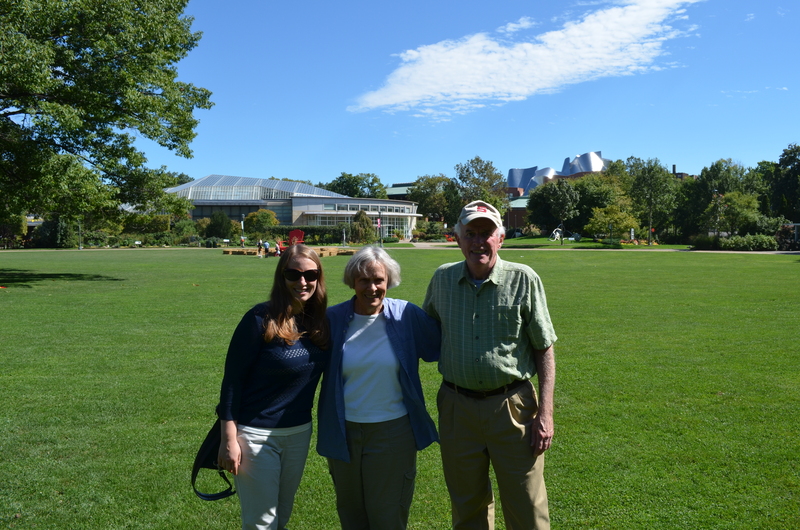 We walked around the grounds, seeing State Champion black walnut and tulip trees that were planted at the Community’s peak 150 years ago. Then we walked around Sunset Lake and over to the Community’s cemetery, where we had our usual fun reading tombstones as a window on history. Just before dark, we drove over to what TripAdvisor called the best restaurant in Oneida. Finding the Tuscan Oven in a strip mall, it could hardly have been less prepossessing, but could not have been more satisfactory, excellent food and drink in a comfortable booth, with fine service and a perfect view of dueling tvs, one with baseball and the other with a cooking show, to keep us variously entertained and bantering. Back at the Mansion House, I continued reading a fascinating new book by a descendent of J. H. Noyes, Oneida: From Free Love Utopia to the Well-Set Table. Slept great, except for a 4 a.m. fire alarm that forced us into a common area with various residual residents, one of whom may have been the mother of the author of that book. When I can, I prefer to wander around on my own rather than taking a guided tour, but I made an exception for the Mansion House tour, free to those staying overnight, at ten the following morning. And I couldn’t have been more gratified. CE and I were the only takers, and the giver was the Community education director Molly, a well-informed and engaging young woman, with whom we strolled around for two hours in a very detailed back and forth. By far the most worthwhile house tour I have ever taken. The plan had been to reach Seneca Falls in time to see the Women’s Rights National Historical Park in the morning, but we got there after stopping for lunch at a strange faux-Amish market that was ranked as best place to eat in town. The park itself was rather underwhelming, and the town quite depressed, so we opted for its second attraction, the Montezuma National Wildlife Refuge, where we could walk along a canal and drive around a large marsh with hundreds and hundreds of birds, ducks and geese and yellowlegs, plus a solitary blue heron and two northern harriers. Thence to Erie, and on to Cleveland, then back again. It’s amazing that of all the times I’ve driven to Cleveland (though few lately), I never thought to go by the Southern Tier Interstates instead of the NY Thruway — much less traffic, more varied scenery, and no tolls, while just a little bit longer drive. When we hit Binghamton and had to get from I-86 to I-88, we ran into another big back-up. Luckily we were right at an exit, and given our success of the night before, figured we could use the phone to find a way to cut across – and did so. Got home before dark. So aside from that one late stall heading west, we ran into no travel problems at all in the course of a week on the road, while seeing lots of sights and sites worth seeing. The Indians clinched the division title on the Monday after we were there, then clinched home field advantage in the playoffs on the last day of the season. And as of the day I write this, the Tribe has swept the Red Sox out of the ALDS, and will face the Toronto Blue Jays in the ALCS. Cleveland rocks! P.S. The Indians win the pennant! The Indians win the pennant! As of the day I write this, the Tribe has vanquished the Blue Jays out of the ALCS in five closely-fought games, and will face either the Cubs or the Dodgers in the World Series. Cleveland rolls! P.P.S. The Indians take the favored Cubs to extra innings of World Series Game 7, for a result similar to 1997, but with quite a different feel. 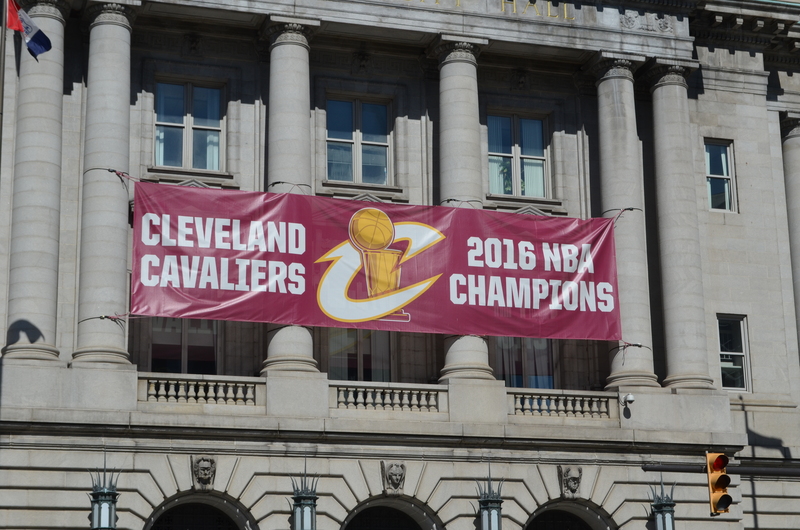 Cleveland says, Wait till next year! What a trip! What a ride! I am so on the bus with these guys! And they’ll all be back next year, except maybe the veteran free agents. Think about it: Starting rotation of Kluber, Carrasco, Salazar, Bauer, and Tomlin. Infield of Lindor, Kipnis, Ramirez, and Santana (with some RH all-or-nothing power guy as 1B/DH partner). Catching duo of Gomes and Perez. Bradley returning to the outfield, a potent Chisenhall/Guyer platoon, and somebody swift and sure to patrol CF (Almonte perhaps, with Naquin as back-up). And the best bus driver in baseball — goes by the name of Tito. Yeah, this boy will sign up for that bus trip next summer. You know what the problem was? The World Series is supposed to be in October. We won October, finished it with a 3-2 series win. “Indians best favored Cubs in October!” the headlines should blare. Instead, it’s all Chicago this and Chicago that. But for me Cleveland will remain “The Best Location in the Nation,” because it is the place of my birth, my hometown, my Tribe.